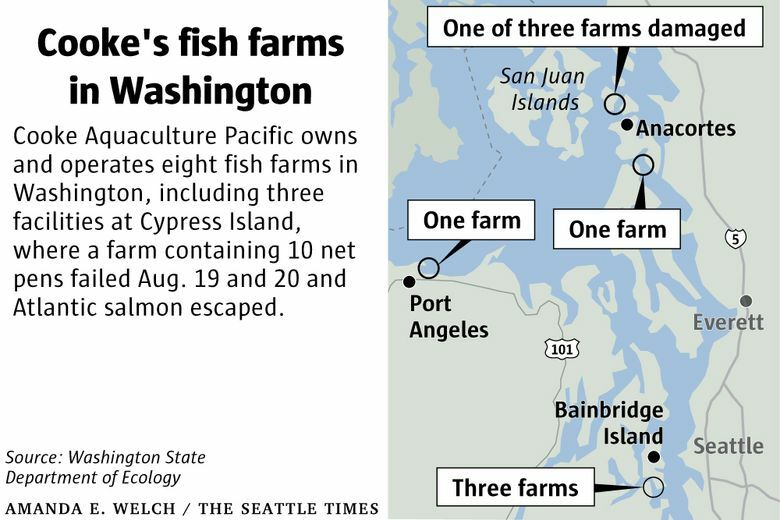 The company initially said Saturday that 4,000 to 5,000 of the nearly 2-year-old fish, weighing from 8 to 10 pounds, had escaped several damaged net pens in the farm. But by Sunday afternoon, "the whole thing came apart." 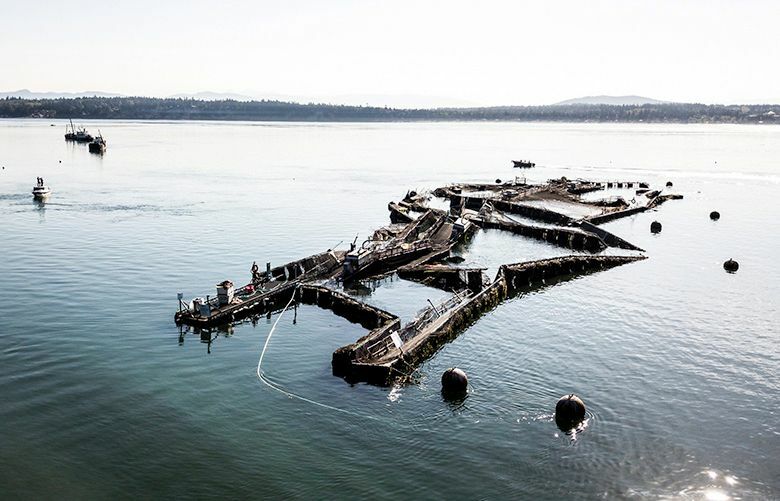 The fish spill from an Atlantic salmon farm near Cypress Island is much bigger than initially thought, after the entire farm was destroyed over the weekend. 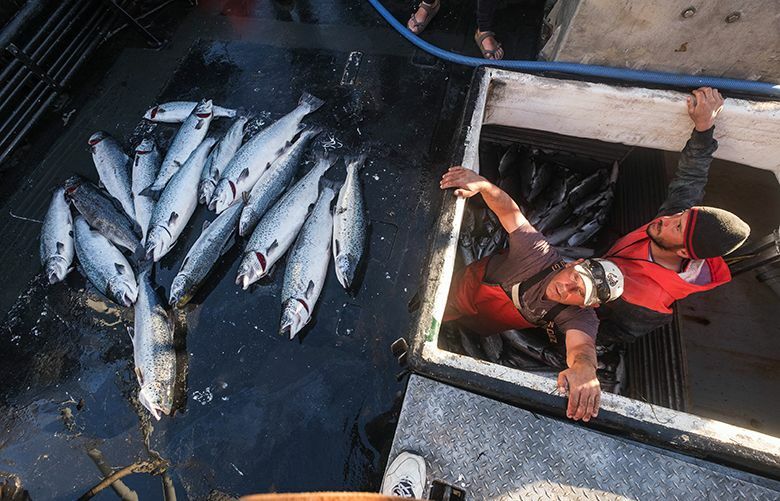 “It’s basically a salvage operation,” said Nell Halse, vice president, communications for Cooke Aquaculture Pacific, which owns and operates several Atlantic salmon fish farms in Puget Sound and the Salish Sea, including the Deepwater Bay facility off Cypress Island. The company initially said Saturday that 4,000 to 5,000 of the nearly 2-year-old fish, weighing from 8 to 10 pounds, had escaped several damaged net pens in the farm. The farm held a total of more than 300,000 fish weighing some 3 million pounds. The company, which bought the salmon farm about a year ago, last month flew in experts to repair it because it had begun to drift, Halse said. Additional anchors were installed, she noted. “The verdict was that the farm was good to go until harvest,” she said, then just months away. Scientists debunked the statement from Cooke on Tuesday that “exceptionally high tides and currents coinciding with this week’s solar eclipse” caused the damage. Jonathan White, author of “Tides the Science and Spirit of the Ocean” (Trinity University Press, 2017), said there were 105 tides this year as large or larger than those experienced over the weekend. “If they were not prepared for this tide, they were not prepared for any tide,” he said. Kurt Beardslee, of the Wild Fish Conservancy, which opposes fish farming as well as a planned expansion by the company in the Strait of Juan de Fuca, blamed the company for inadequate equipment and maintenance. The company had more to say Wednesday about the cause. 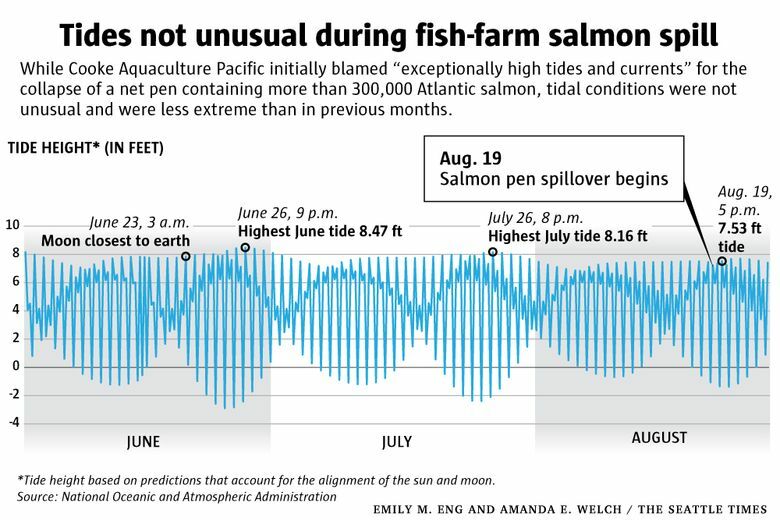 “We don’t want to debate the data about the tides,” Halse said. “It says what it says. Whatever the reason, the guys experienced something they had not experienced in their memory,” she said of farm employees. “There obviously is not one reason why this happened; it was not just the tides. We will be doing a full assessment as to what really caused it, and most importantly, what we can do to make sure it never happens again.” Meanwhile, a fishing frenzy is under way, with some anglers eager to get the fish for their table and others mopping the Atlantic salmon up like a pollutant. 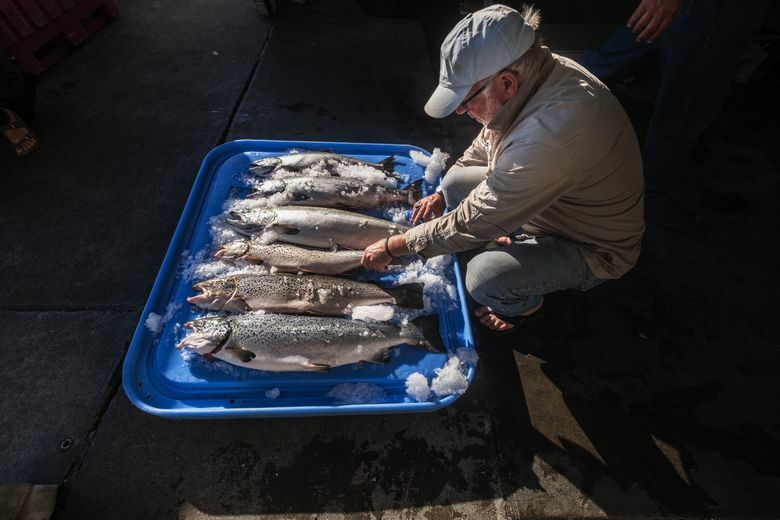 Some found passions against farmed salmon undercut a golden opportunity in the no-limit fishery. “I had no idea there would be that many,” said Nik Mardesich, a commercial gillnetter who kept pulling up Atlantics by the hundreds in his net while he was out for native chinook Monday night. However, he couldn’t find a buyer for his bounty on Tuesday morning. “They won’t even take them for crab bait,” he said of the Atlantic salmon. “I don’t want to just throw them on the beach, so I am trying to give them away,” Mardesich said. He resorted to putting a sign reading “free fish” on his pickup at the Guemes ferry, and passing the salmon out in garbage bags. The Lummi Nation mounted a cleanup fishery Tuesday, deploying boats to mop up the fish like an oil spill. “This type of incident is unacceptable,” said Timothy Ballew II, chairman of the Lummi Nation business council. Halse and the Washington Department of Fish and Wildlife maintain the fish are safe to eat and pose little risk to the environment.